Below I document the performance of the strategy using the risk-parity implementation. As you will see the performance is comparable. The risk-parity implementation experienced worse drawdowns than the inverse risk-parity strategy. The worst drawdown periods statistics show that the risk-parity approach suffered dramatically in 2015 and did not recover before the end of the backtest period significantly underperforming the inverse risk-parity approach which did recover before the end of the backtest. 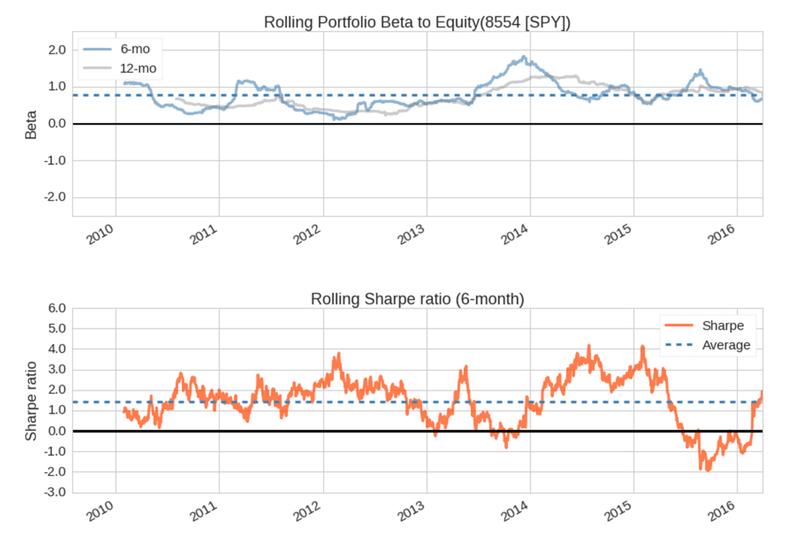 Both strategies suffered negative rolling Sharpe ratios in 2015 however the inverse risk-parity approach recovered much quicker. The risk-parity implementation lost money in 2015 whereas the inverse risk-parity approach actually had a small gain. Is there a logical explanation that can explain the disparity in strategy performance between the risk-parity approach and the inverse risk-parity approach? Why would increased exposure to volatility improve the drawdown statistics, the cumulative returns, and the mean annual returns? Perhaps, once we analyze why the strategy was successful in the upcoming Part 2, we can draw some conclusions that could help us answer the aforementioned questions.